It is a documentary which looks for all the world as though it’s a superbly crafted script, as much a tale of pure, honest, working class triumph as just another rock’n’roll story. 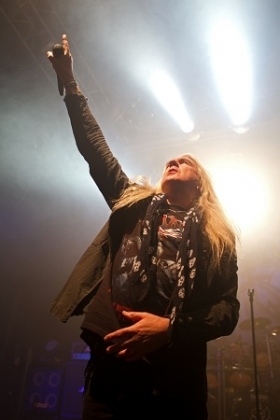 Heavy Metal Thunder – The Movie shows every facet of Saxon on their journey without once diluting the true characters who make up the band. “We basically played every dump and shithole that there is in England over a period, probably just short of eight years,” laughs Biff. “You know classic cliché of transit van, up and down and we used to play more or less every night. One gig might be a good paying gig and the other one might be no money or ten quid but it was an obsession, you had to play every day.” These wonderfully naïve young men sought nothing more than a great gig, a good time and maybe a nice girl, before suddenly finding themselves on tour in the US, exposed to the sorts of things which (quite frankly) Barnsley simply didn’t offer in 1980. And from that point, Heavy Metal Thunder – The Movie, takes the viewer on a journey - on a rock’n’roller of a journey encompassing it all from triumphs to tears to tea-bags and beyond. Nothing is forsaken and nothing skipped. Despite the fact that to this day there remain problems between the Byford/Quinn and Oliver/Dawson parties, everyone tells the full-unedited Saxon story with heartfelt honesty and integrity.